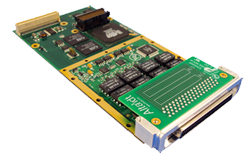 Alta Data Technologies’ XMC-MA4 interface module is a multi-channel, multi-protocol 1553 and ARINC PMC card supported by the latest software technologies. Ideal for SBCs or carriers for VPX, VME and cPCI (Compact PCI/PCIe or PXI) - Commercial or Rugged/Conduction Cooled Systems. This hardware and software package provides increased system performance and reduces integration time. The First Card in the Industry to Offer Advanced Test Functions of Signal Generation and A/D Signal Capture. Alta Data Technologies’ XMC-MA4 interface module is a multi-channel, multi-protocol 1553 and ARINC XMC card supported by the latest software technologies. The PMC card are based on the industry’s most advanced 32-bit FPGA protocol engine, AltaCore™, and by a feature-rich application programming interface, AltaAPI™, which is a multi-layer ANSI C and Windows .NET 2.0 (MSVS 2005 C++, C#, VB .NET) architecture. This hardware and software package provides increased system performance and reduces integration time. The XMC-MA4’s BC capability includes variable message/label framing/subframing with transmission scheduling provides the most advanced control operations. ARINC TX has complete frequency control per channel. RT and ARINC RX, Monitor, Playback and Signal Generator functions also include industry leading functions to meet the most demanding requirements. AltaCore is guaranteed 1553B Notice II & IV and ARINC compliant and all cards are manufactured to the highest IPC-Level 3 standards and certifiedISO 9001:2008 processes. Playback and Signal Generation are part of BC-TX operations. We are committed to a risk free integration and will be glad to help with any level of your system development. Here you can find documentation pertaining to the XMC-MA4. For additional documentation and software, please visit our secure download area. XMC-MA4-1D8-T XMC Interface (4 Lane) with One Channel of Dual Redundant MIL-STD-1553 with Dual Function (BC/Mon or mRT/Mon) Capability and 4 Shared Tx/Rx Channels and 4 Rx Channels of ARINC-429 and 2 Rx/2 Tx ARINC-717 Selectable Channels (Each 717 Rx/Tx Replaces Two 429 Channels). Included: Thumb Screw SCSI I/O Connector (Must Use -T Series Mating Connector) and AltaAPISoftware. XMC-MA4-2D8-T XMC Interface (4 Lane) with Two Channels of Dual Redundant MIL-STD-1553 with Dual Function (BC/Mon or mRT/Mon) Capability and 4 Shared Tx/Rx Channels and 4 Rx Channels of ARINC-429 and 2 Rx/2 Tx ARINC-717 Selectable Channels (Each 717 Rx/Tx Replaces Two 429 Channels). Included: Thumb Screw SCSI I/O Connector (Must Use -T Series Mating Connector) and AltaAPISoftware. XMC-MA4-3D8-T XMC Interface (4 Lane) with Three Channels of Dual Redundant MIL-STD-1553 with Dual Function (BC/Mon or mRT/Mon) Capability and 4 Shared Tx/Rx Channels and 4 Rx Channels of ARINC-429 and 2 Rx/2 Tx ARINC-717 Selectable Channels (Each 717 Rx/Tx Replaces Two 429 Channels). Included: Thumb Screw SCSI I/O Connector (Must Use -T Series Mating Connector) and AltaAPISoftware. XMC-MA4-4D8-T XMC Interface (4 Lane) with Four Channels of Dual Redundant MIL-STD-1553 with Dual Function (BC/Mon or mRT/Mon) Capability and 4 Shared Tx/Rx Channels and 4 Rx Channels of ARINC-429 and 2 Rx/2 Tx ARINC-717 Selectable Channels (Each 717 Rx/Tx Replaces Two 429 Channels). Included: Thumb Screw SCSI I/O Connector (Must Use -T Series Mating Connector) and AltaAPISoftware. XMC-MA4-5D8-T XMC Interface (4 Lane) with Five Channels of Dual Redundant MIL-STD-1553 with Dual Function (BC/Mon or mRT/Mon) Capability and 4 Shared Tx/Rx Channels and 4 Rx Channels of ARINC-429 and 2 Rx/2 Tx ARINC-717 Selectable Channels (Each 717 Rx/Tx Replaces Two 429 Channels). Included: Thumb Screw SCSI I/O Connector (Must Use -T Series Mating Connector) and AltaAPISoftware. XMC-MA4-1F8-T XMC Interface (4 Lane) with One Channel of Dual Redundant MIL-STD-1553 with Full Function (BC/mRT and Mon) Capability and 4 Shared Tx/Rx Channels and 4 Rx Channels of ARINC-429 and 2 Rx/2 Tx ARINC-717 Selectable Channels (Each 717 Rx/Tx Replaces Two 429 Channels). Included: Thumb Screw SCSI I/O Connector (Must Use -T Series Mating Connector) and AltaAPISoftware. XMC-MA4-2F8-T XMC Interface (4 Lane) with Two Channels of Dual Redundant MIL-STD-1553 with Full Function (BC/mRT and Mon) Capability and 4 Shared Tx/Rx Channels and 4 Rx Channels of ARINC-429 and 2 Rx/2 Tx ARINC-717 Selectable Channels (Each 717 Rx/Tx Replaces Two 429 Channels). Included: Thumb Screw SCSI I/O Connector (Must Use -T Series Mating Connector) and AltaAPISoftware. XMC-MA4-3F8-T XMC Interface (4 Lane) with Three Channels of Dual Redundant MIL-STD-1553 with Full Function (BC/mRT and Mon) Capability and 4 Shared Tx/Rx Channels and 4 Rx Channels of ARINC-429 and 2 Rx/2 Tx ARINC-717 Selectable Channels (Each 717 Rx/Tx Replaces Two 429 Channels). Included: Thumb Screw SCSI I/O Connector (Must Use -T Series Mating Connector) and AltaAPISoftware. XMC-MA4-4F8-T XMC Interface (4 Lane) with Four Channels of Dual Redundant MIL-STD-1553 with Full Function (BC/mRT and Mon) Capability and 4 Shared Tx/Rx Channels and 4 Rx Channels of ARINC-429 and 2 Rx/2 Tx ARINC-717 Selectable Channels (Each 717 Rx/Tx Replaces Two 429 Channels). Included: Thumb Screw SCSI I/O Connector (Must Use -T Series Mating Connector) and AltaAPISoftware. XMC-MA4-5F8-T XMC Interface (4 Lane) with Five Channels of Dual Redundant MIL-STD-1553 with Full Function (BC/mRT and Mon) Capability and 4 Shared Tx/Rx Channels and 4 Rx Channels of ARINC-429 and 2 Rx/2 Tx ARINC-717 Selectable Channels (Each 717 Rx/Tx Replaces Two 429 Channels). Included: Thumb Screw SCSI I/O Connector (Must Use -T Series Mating Connector) and AltaAPISoftware.